Standards play crucial roles in many different aspects of today’s economy. They can define meanings of semantics, product interfaces, process steps, or performance levels. 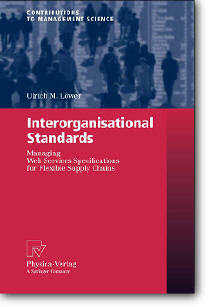 Interorganisational standards are specifications that define business-related semantics and processes, which are made accessible to other organisations’ information systems. While modular organisation forms such as supply chain networks demand such standards for higher flexibility, XML-based Web Services offer a relatively new technological platform to develop such standards. The development of comprehensive interorganisational standards, however, is far from being completed. This book thus answers the questions, how interorganisational standards are developed and how different actors should get involved in it. The author uses actor-network theory to conduct two in-depth case studies on ebXML and RosettaNet. While researchers will find new explanations for the development of interorganisational standards, managers and executives will benefit from the strategic implications this book discusses.